The Belmont Bruins hit 14 three-pointers and rode a big second half lead to a 78-69 win over the Georgia Bulldogs Wednesday night at Athens in the first round of the National Invitational Tournament. Ohio Valley Conference regular season champion Belmont regained their three-point accuracy Wednesday night, making 14 of them while defeating the Georgia Bulldogs 78-69 in Athens to win their first round National Invitational Tournament game. Dylan Windler led the Bruins with 21 points. He made seven of 11 shots from the floor, including a trio of three-pointers. Evan Bradds and Taylor Barnette added 15 each, and Amanze Egekeze 14. Egekeze and Barnette also made four three-pointers. They took advantage of a Georgia team that was missing its second and third leading scorers. Yante Maten and Juwan Parker were each out of the game due to injuries, and while the Bruins couldn’t stop J.J. Frazier, they clamped down on the rest of the Bulldogs. Frazier had a spectacular game with 29 points, hitting 11 of 12 free throws and nine of 22 from the floor, but didn’t get much help from anyone else. William Jackson II and Tyree Crump had 10 points each for Georgia. The Bulldogs made only four of 17 shots from three-point territory. It was Belmont’s 23rd victory of the season against only six losses. Belmont had five three-pointers early in the first half, and at one point had a nine-point lead. 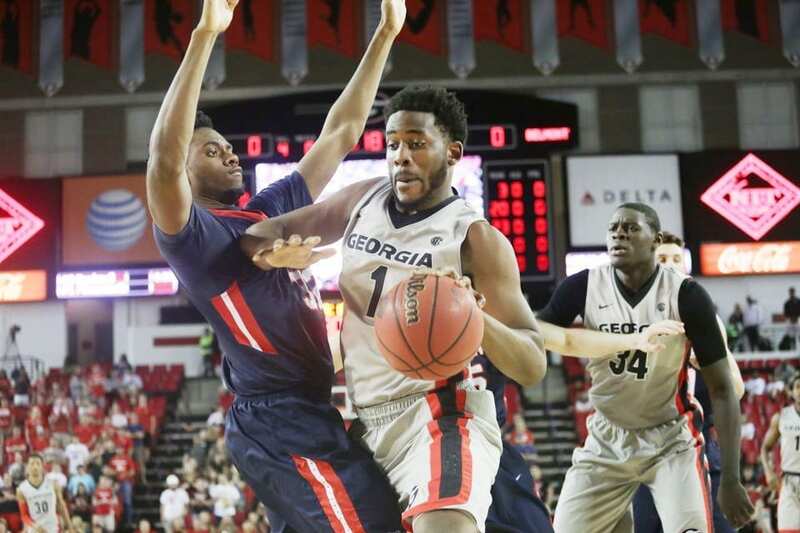 But Georgia held them scoreless over a three-minute period while scoring seven straight points to narrow the margin. Belmont regained the lead and was ahead at halftime 37-34. Then Belmont made five straight three-pointers in the first five minutes of the second half, forging ahead by 11 at 54-43. They extended the lead to 68-54 before Frazier went on a personal tear, scoring six straight points and getting the Bulldogs back in the game. But Belmont held Georgia to only seven points in the final four minutes, and cruised into the victory. The Bruins shot almost 46 percent from three-point territory (14 of 31 for 45.2) and they also outrebounded Georgia 35-32. The Bulldogs finished their season at 19-15. Belmont’s next NIT game will be against another team from Georgia, Georgia Tech, also 19-15.